Are your current services unreliable or not getting the job done? Maybe you're tired of spending your free time on evenings and weekends tending to your yard. Maybe after all of your blood, sweat and tears... it just doesn't look like you want it to. In any case, that's where we come in. We offer a wide variety of services - depending on your preferences and needs. So take a look and some of our most common services provided and then call for your FREE estimate. We are a state-licensed and insured full-service lawn care company...but most importantly, we care about what we do. We are in this line of work because it's what we enjoy doing. Trimline takes pride in providing dependable and reliable care for your landscaping needs. Our equipment is kept up to date and well-maintained, to provide the highest quality appearance, performance and results while working on your property. Spring/Fall Clean Up - We can clean and turn your flower and vegetable gardens, trim bushes, small sod repair, leaf raking and other miscellaneous landscaping jobs. These services are billed at an hourly rate. There may, at times, be an additional charge for disposal on a large job. Gutter Cleaning - If your gutters fill up with muck during the change of the seasons and during the summer months, we'll get them cleaned up and free flowing again. Overflowing or slow-running gutters can lead to water problems for your house and foundation. If you have heavy foliage above your house, more frequent cleanings may be preferred. Salting & Snow Removal - Don't break your back, let us do the hard work for you. We can set up a snow-removal plan to come after certain amounts of rain, sleet or snowfall to rid all walks, driveways and parking lots of snow and to can apply salt treatments to aide in traction. Aerating - This procedure is becoming very popular and highly utilized because it effectively loosens compacted soil and clay. We use core aerators that pull round plugs of dirt from your lawn. We leave those plugs so that they can be dissolved back into the ground. Doing this helps fertilizer and water get to the roots of the grass and begin to work systematically, while maintaining the nutrients in your yard. We typically offer this service in the spring and fall months, where the benefit is the greatest. Power Raking/Dethatching - This procedure removes the naturally occurring accumulation of thatch (dead grass and root material) from your lawn. Doing so allows water and nutrients to be more uniformly and quickly absorbed and for new grass sprouts to grow more easily. If you need an opinion on whether or not this service would benefit you, call us and we'll come take a look. Spring or autumn when lawns are dormant is the best time to do this work. Holiday Decorations - Install & removal of holiday lights can be scheduled. There are many different options and arrangements that can be made such as selection, placement, etc. Fixed or Flexible Schedule Mowing - On a regularly scheduled basis, we tend your lawn with properly trained personnel, and appropriate and well-maintained equipment. Your service intervals will be dependent upon your landscape's requirements and your personal preferences/expectations. This service includes weekly mowing and trimming of all grass areas as well as edging along concrete walks, driveways, and patios. Of course, we thoroughly clean up the debris and package your clippings for proper disposal. Need a special "touch up" in preparation for a party or event? No problem. Just let us know ahead of time, and we'll make sure your yard is fresh and ready before your company arrives. Professional Edging - Keep grass where it belongs... in the dirt. One of the keys to a professional landscape presentation is clean lines allowing the grass to stop before crawling all over your sidewalks, driveway, patio, etc. Lawn Seeding & Fertilization - Make sure your lawn has the nutrients it needs to provide you with a lush and healthy green lawn. We offer fertilization options at various points throughout the growing season, that will be customized to your lawn's specific requirements. Weed & Pest Control - Whenever we apply these products, we do so sensibly and safely using only the amount necessary to control the problem. We only spot spray for specific problems to avoid the excessive and unnecessary use of chemicals. In the early spring we offer pre-emergents to inhibit the later development of crabgrass and spurge. In the late spring, we offer a broadleaf weed control. In the summer, we apply herbicide to control and kill broadleaf weeds such as dandelions, chickweed, and clover, and continue as always to check for potential problems. In the fall, we offer broadleaf weed control one more time. We reapply herbicides intermittently, if necessary. Fill Dirt Distribution - Dirt fill may be required to improve low spots, or to correct grade problems that channel water toward your house rather than away from it. Fill dirt can also be spread to raise flower beds for additional height/viewing, or to replace dirt that has eroded away over time. Sod Installation - If you're looking for a quick solution for new grass, we can install sod to minimize the period dirt is exposed on your property. Sod can also be used for a quick-fix when a small portion of your lawn has been cut out for repair work or due to other circumstances. Landscaping Installation & Removal (Trees, Bushes, Flower beds -Annuals & Perennials etc.) - Ready to add a splash of color or pizzazz? Maybe you've decided on something new and need to remove some pre-existing plants? Either way, we're here to help. From installing trees, bushes and flower beds to helping with potted plants or plant hanging, Trimline is ready and able. We can help with plant suggestions or can execute a pre-designed plant scheme if you already have something in mind. Bush & Hedge Trimming - Without proper and consistent trimming, bushes and hedges can quickly get out of control. Once overgrown, it can be hard to get them back into the proper shape. Trimline will keep up with your bush and hedge growth to make sure they are properly maintained. 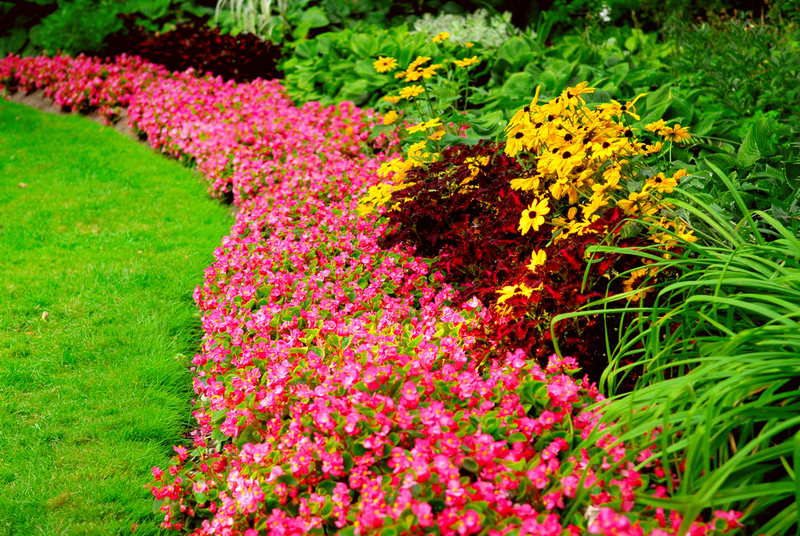 Flower & Bush Fertilization - Just like your lawn, we can provide weed & feed solutions for your flower beds and bushes to make sure they reach their optimum growth and bloom for the seasons. Flower Transplanting - Usually done in the spring or fall, we can help make your large pre-established flowers go further by dividing and transplanting them for you. This is commonly done with bulbs, hostas, grasses, etc and is a great economical way to spread your investment out. Mulch and Rock Spreading - By applying a foundation to your landscaping such as mulch or rock, you enhance the water retention for your plants and also improve the cleanliness and attractiveness of your plant beds. We can help determine which is right for you - however it mostly depends on personal preference and the level of maintenance you prefer. Underground Gutter Drainage (buried downspout outlet) - If you trip over drain downspouts that direct rain water away from your house, or if your yard gets ruined by a fast stream of water runoff, we can bury them so they discharge into the lawn for more even absorption. This also provides a cleaner look for your house, as well as better distribution of water for improved grass growth. Landscape Lighting - We offer installation of landscaping lighting for up lighting of plants/trees, illumination of walk ways and flower beds, or to just provide some additional focal points or enhance visibility. Retaining Walls - Retaining walls and borders can enhance the look of your landscape beds as well as help control water runoff and soil erosion. Decks/Patios/Fences - Trimline Landscaping can help increase your outdoor living space by building back and side decks or patios and fences for maximum outdoor enjoyment. Costs varies depending on size and desired materials, but we can help you decide what materials and design options would be right for you.